Steve Davies, chief executive of the Advertising Producers Association, has made a public plea to WPP boss Sir Martin Sorrell to not just "talk" integrity when it comes to asking Google to clean up its mess. 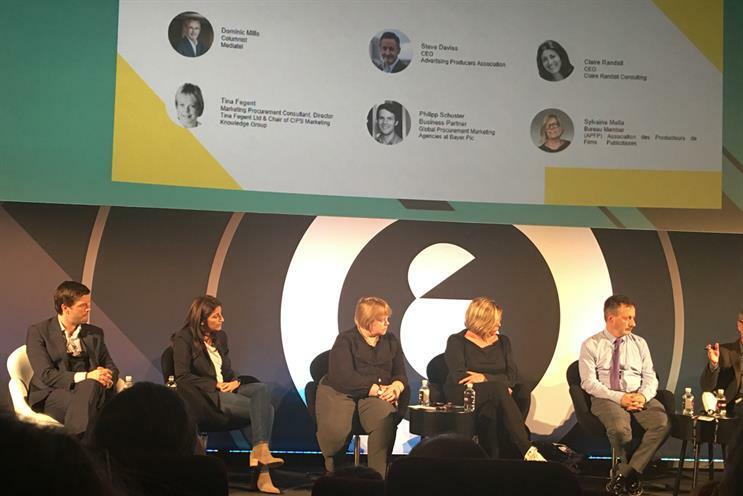 Speaking on a panel discussion at Advertising Week Europe yesterday, Davies also called on Sorrell to "show integrity" when it comes to production commissioning process. Davies was referring to the WPP chief executive's recent calls for Google to take responsibility for brand safety. He said: "Sorrell has been talking about integrity over Google’s advertising scandal, maybe WPP needs to show it as well. We would like to ask both WPP and Omnicom not to have their in-house production units bid against independent agencies." The APA represents the interests of production, post-production, VFX and editing companies involved in making ads. The panel discussion – which also included independent procurement consultant Tina Fegent; production consultant Claire Randall; procurement specialist at Bayer, Phillip Schuster and Sylvaine Mella from Association des Producteurs de Films Publicitaires – was against the backdrop of a recent rigging scandal in the US, with ad agencies found to be rigging production bids to favour their in-house studios over independent production houses. The US department of justice has since launched an investigation to determine whether the bidding process is being manipulated by the holding company agencies in an attempt to send more work to their internal studios. Randall, however, disagreed that it would be unfair for brands to be presented with an "either or" situation in the auction process – holding company’s in-house production divisions or independent production agencies. "It falls on the client to manage the process properly. For instance, the bids could go direct to the client or the procurement person, or there could be different deadlines. It has to be fair to both parties," she added. Mella believed that the practice of soliciting quotes from independent production companies that the holding companies know they can undercut is happening in France as well, though it is less certain that it is actually illegal. The UK, according to the panel, has the same set of concerns; Schuster commented that holding companies cannot be "allowed to be both the referee and the players. It is not sustainable." "There are sometimes no rules in an oversupplied market," added Fegent and said that some these issues have been created because of consolidation in the advertising industry which has created a culture where holding companies are putting constant pressure on their agencies to come up with the next revenue stream. Fegent was, however, quick to point out that the agency model as we know it is not broken. "In every business models, models change and evolve. And what we are seeing is not symptomatic of a broken agency model," she added. "Clients and agencies have to be transparent and open with each other, like in any marriage, and as procurement specialists it is our job to give them guidance." Where was the work at Advertising Week Europe?